According to the Chinese zodiac calendar, 2014 is the Year Of The Wood Horse or the Green Horse. 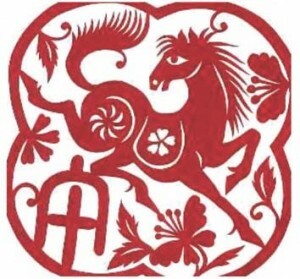 This Chinese New Year begins on January 31st, 2014 and some sources say February 4th is the day the Year of the Horse begins. The end of the year is February 18th, 2015. The horse which is the seventh sign in Chinese astrology is a symbol of nobility, elegance and determination. The Chinese like Horses for many reasons. The Horse provided a good and quick transportation for people before automobiles. Horses can give people a ride to their destination. Therefore, the horse is not only a symbol of traveling, but also a sign of speedy success. Horses like to compete with others. They are in pursuit of their freedom, passion and leadership. Therefore, people will have busy schedules for their goals in the year of Horse.